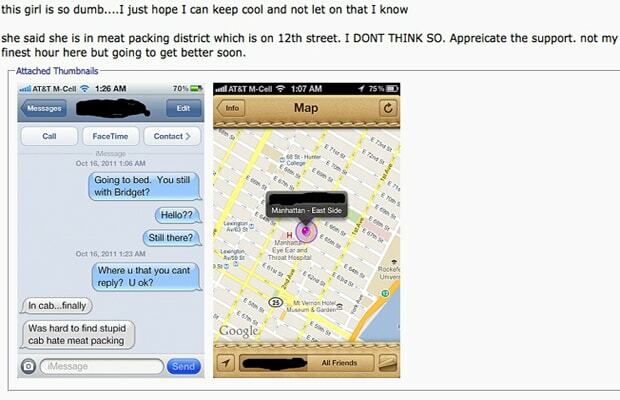 Cheating Wife Caught By iPhone 4S' "Find My Friends"
“Find My Friends,” unlike the rather useful-after-a-night-of-drinking “Find My iPhone,” is a rather creepy app that’s been launched with iOS 5. Ideally meant to track whether your kids came home from school or paid a visit to the local weed dealer, it more broadly lets you send requests to your friends so that you can map where they are at all times. It&apos;s awkward any way you look at it. Yet, one user may have justified spying with the app. A certain “ThomasMetz” told MacRumors he bought his wife a new iPhone 4S, loaded up the spy app, and tracked her movements. Suspicious of potentially infidelity, he received a text from his wife saying she was in the Meatpacking District in Manhattan. “Find My Friends” said she was in the Upper East Side. Oh snap! Now, the husband plans to divorce. However, spying with the iPhone is legally in the grey, so it could ultimately work against him. No luck for that guy.